It was not so long ago that barcode reader systems were a significant investment in hardware. The cost of installing the system, not to mention the devices themselves, made them a luxury few businesses could afford. Today, it’s time to revisit those decisions. The technology of barcode readers has developed quite a bit in recent years, a topic we wrote about at length recently. Briefly, smartphones, iPads, and other tablets, as well as specialty devices, are being modified and used in warehouse environments. Inexpensive and reliable networking equipment and routers are making wifi access ubiquitous. Cloud software is enabling faster and better integration and updates. All of this is making barcode reader systems much more affordable and much easier to implement. The obvious reason to use barcode readers is that these systems automate data entry into your system. Received items can be scanned and catalogued quickly, and their movements through the warehouse can be tracked precisely. This further allows real-time updates, which make better customer service and labor management possible. Another trick that warehouses are using is to create “barcode cheat sheets” for frequently keyed data beyond the typical lot number, PO, or station location. For example, say a warehouse has a fairly consistent set of products and so stores a small number of sized boxes with specific dimensions. These dimensions are needed at the shipping station to calculate DIM weight. The boxes themselves can be barcoded so that a quick scan enters their dimensions automatically, making shipping more efficient and less error prone. In any warehouse or fulfillment operation, labor is the biggest expense. There are significant savings, then, in optimizing everything that your labor force does. That optimization can occur at many different steps but are most significant at put-away and pick. Consider put-away: If your Warehouse Management Software is configured to find the most optimal placement of items in your warehouse, a quick scan from a reader can display that location, perhaps even triggering a lighting system to highlight it. And during picking, for example, workers can scan UPC codes to ensure that they have the exact right product, thus cutting down on error and redundant trips to shelves. If inventory is heavy or awkward, or if machinery is needed to move or place it, your floor workers will want to have both hands available for the job. 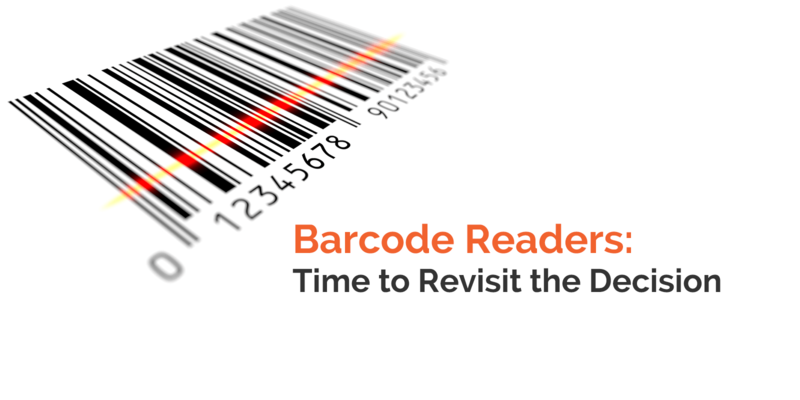 Many of today’s barcode readers are smaller and more portable, which helps. Using them requires only a quick motion, compared to the effort needed to write on a clipboard or use a similar manual process. While this is not 100% hands-free handling, it does allow handlers more freedom of movement (and less time writing). Having barcode readers plus appropriate software can help automate each of these processes. As a bonus, the integration needed to implement this automation has a number of other benefits as well. When using barcode scanners, an organization is not simply keeping track of items and their location in the warehouse. They are also generating data about workflow, labor, use of space, and more. This data can be used directly to make decisions about operations. For example, would your warehouse benefit from using forward staging for some popular items? This is a question that is hard (if not impossible) to answer unless you knew how fast the item was selling, where it was being stored, and how quickly/how often it was being “picked.” The kind of automated data entry afforded by barcode readers can provide decision-makers with real-time data for this kind of decision-making. Many of these reasons are already known to larger operations with more complex processes and larger inventories. Again, though, smaller operations can now benefit from the technology as well. The capital investment is not nearly as high as it once was, and the systems are easier to implement and use. This all means that smaller operations now have access to the kinds of tools that make faster fulfillment and better customer service possible. The little guys can, once again, compete with the giants on a level playing field.